Enjoy the benefits of dustless sanding, but at a reduced cost! 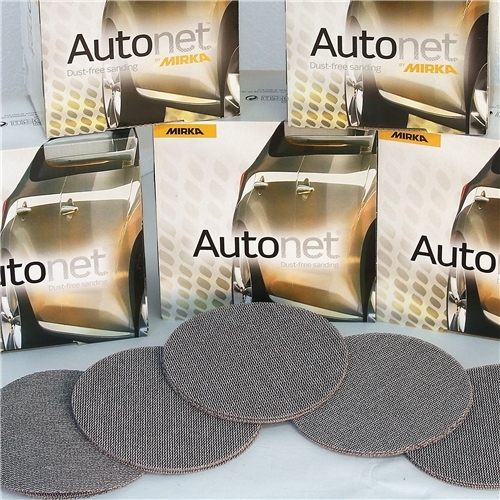 Consider Mirka AutoNet, the performance optimized, lower cost mesh disc option. Originally produced as an Abranet variant for the highly cost competetive autobody industry, Mirka AutoNet has virtually identical performance to the original Mirka Abranet disc, but at an attractive lower cost. Local cabinet production shops that have used AutoNet mesh discs have reported no difference in cutting and durability compared to Abranet on their woodworking and woodfinishing applications. Take advantage of superior dust collection with strong performance at a reduced cost. Mirka Abranet 5" H&L Mesh Discs. Range 80 to 800 grit. Mirka Abranet 6" H&L Mesh Discs. Range 80 to 800 grit.